Russia is in the news again and will stay there for as long as we can see. We need to look at the country again trying to understand its political trajectory from 1985 to 2018. Dr. Oborotova will tell the story of Russia’s evolution focusing on three recent Russian leaders – Gorbachev, Yeltsin and Putin. Leaders matter in any country, but in authoritarian states they play a much more important role, heavily influencing the course of events and direction of development. Gorbachev’s efforts to reform the Soviet Union destroyed it. Yeltsin’s poor health undermined his democratic intents and actions and threw the country into chaos. And Putin’s policy to install order brought Russia back to authoritarian rule. Why is it so difficult for Russia to escape her authoritarian past? Is there any hope? 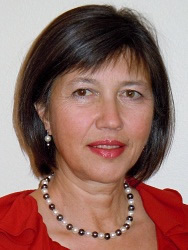 Dr. Marina Oborotova is the Albuquerque International Association founder and president. She was born and schooled in Russia, worked and lived in Europe, Latin America and for the last 25 years – in the United States. Professionally, Dr. Oborotova is the author of multiple articles and books on foreign affairs. She worked for Russia’s leading think tank, USIC, TC International and taught at UNM’s History and Political Science Departments and the Anderson School of Management.